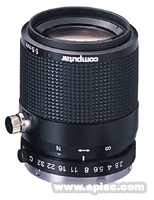 * Very low distortion compared to standard macro lenses. * Wide depth of field. * Suitable for use as a telephoto lens and macro lens. * Fast F2.8 F-stop at Infinity.